A fantastic, cubist, giltwood-framed mirror. A wonderful, optically-alluring geometric frame playfully jutting out of its expected space at various angles; adding to the illusion, a subtle gold gradient change diagonally across its entirety. Chic and highly decorative, an unexpected utilitarian element. 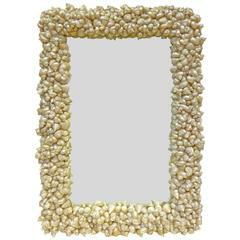 Handsome Italian mirror with giltwood carved lattice frame. 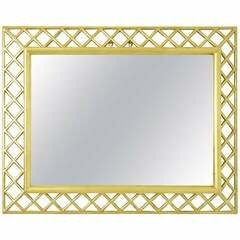 Mid-20th century giltwood framed design details hanging wall mirror. The hanging wall mirror measure about 45 inches length x 33 inches width. Rectangular French mirror 19th century gesso with gilt undulating and rope design. 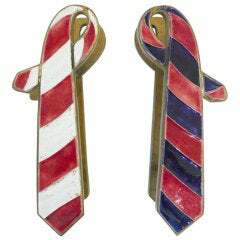 Can be hung vertically or horizontally, for mantel or fireplace. Original mirror. 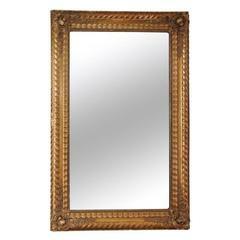 Neoclassical giltwood mirror with stylized floral, leaf and urn motives. In the style of French Louis XVI. Carved and gilt Italianate mirror embellished with the flourishes of neo-classicism.